We customize to your needs! Every hospital, even every department within a hospital, is different in many ways – strategic priorities, technical conditions, process workflows, types of patients and budgets will all vary. The CareServant portal consists of a core architecture and basic functionalities which can can be quickly installed in any hospital environment. Plus, it is very flexible to adjust to the specificities of each institution. There are different aspects of customisation which hospitals can choose from in the CareServant solution. CareServant uses various types of centrally managed devices, including fixed terminals, iPads and Smart TVs, and also support Android mobile devices as part of a BYOD solution. We can manage different types of devices concurrently within one management system. That allows us to create outstanding user experiences (e.g. iPad plus TV in single bed room) and to manage transition from current to new devices over a longer period of time. We have excellent experience with iPads; already at 9,7″, patient feedback is – due to the outstanding display resolution – very positive. Ipads have to be protected by an enclosure that is easy to attach to an arm or a stand. It needs to be theft-proof, antibacterial and with good audio functionalities. Our preferred solution for a 9,7″ iPad is the one from our partner company iQmount. 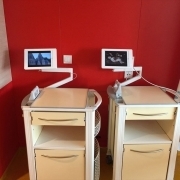 iPads and Terminals are best used with a mounting solution, which gives patients the hands-free user experience, with the flexibility for distance and angle. For additional flexibility, Careservant has developed a stand with 3 possible positions (landscape flat, landscape steep, portrait), which can be connected to the mains via a steel reinforced cable. (This solution is well suited for waiting rooms and outpatient stations). 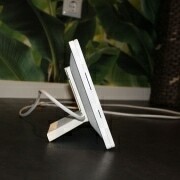 Our mounting solutions are using the VESA 75 standard to connect the device with the arm/stand. BYOD solutions can be offered for the more recent iOS and Android devices (tablets and mobile phones). With a customised authentification process patients have access to all the applications within the hospital network; some applications can also be accessed from outside the hospital network, for example from home. 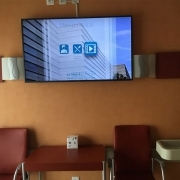 For many hospitals, infotainment is a basic offer and is therefore not charged to the patient. However, the CareServant Management System makes it possible to differentiate: some services (eg Free TV, Basic Clinic Information) can be offered free of charge, and others can be chargeable. Differentiating between various patient groups (Standard vs. VIPs) can also help tailor the offering. Our integrated accounting and payment functionality makes the charging of the patient easy and transparent. By differentiating between different patient groups (for example standard or supplementary insurance), different amounts can be calculated or customized services can be offered. We offer both OPEX and CAPEX models, or a combination of both, depending on hospitals’ investment and budget preferences. Automated and fully dynamic personalisation is possible via CareServant’s own HL7 middleware. This integrates our portal with the Hospital Information Systems. Thanks to a simpler form of personalization (without HL7) the patient can fill in some important personal data beforehand. Based on this information, the content can be personalized and privacy guaranteed. We can offer a static version of the software with the same content for all patients so that hospitals can start quickly with minimal internal resources. We often start co-operations with hospitals via a small scale Proof-of-Concept (PoC) or pilot project. 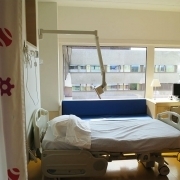 In many cases hospitals are looking to start “small”, either in terms of functionalities or in terms of number of hospitals beds, and to roll out in phases once first experiences are made. We can project manage also large and complex implementation including different types of integrations with 3rd party software.